Residents have been allowed to return home after being evacuated following an "ammonia leak". Half a tonne of the gas was believed to be have leaked from Beta Heat Treatment Ltd in Summerton Road, Oldbury, on Friday. The fire service was called at 18:00 BST and homes and businesses in a 100m (328ft) radius were evacuated. The cordon was lifted on Saturday morning, according to emergency services. Thermal processing and metal engineering firm Beta Heat Treatment Ltd has been contacted to comment. West Midlands Fire Service said it left the scene at 02:00 BST on Saturday after specialists had "isolated" the "leaking ammonia tank". The service confirmed that six workers were led to safety from the scene and one was treated for minor injuries by the ambulance service. West Midlands Police said it had also been stood down on Saturday. 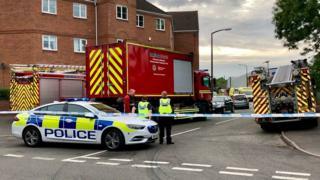 A spokesman for the fire service added that a "damaged valve" was believed to have caused the leak at the site, which uses ammonia to harden steel. Exposure to high levels of ammonia can cause burns and swelling in the airways, lung damage and can be fatal, according to Public Health England (PHE). Breathing in low levels of ammonia may cause irritation to the eyes nose and throat.